It was truly a sight to behold. Fourteen 6th graders lining up for a chance at the microphone of Amateur Radio Club Station N2SJ at the New York City Center for Space Science Education in Lower Manhattan for a chance to speak to Astronaut Doug Wheelock KF5BOC as part of a training contact on behalf of NASA. The Steve Jacobson Memorial Amateur Radio Association has supplied the Manhattan Challenger Learning Center in New York City with an amateur radio station. We have used this in the past to allow New York City Public School students visiting the Space Science Center on the Lower East Side of Manhattan to monitor live astronaut communications during NASA shuttle missions. We were very pleased to receive an email from Kenneth Ramson, N5VHO at NASA asking us to participate in an astronaut training session on January 21, 2010. In preparation for astronaut amateur radio communications with students from the International Space Station, during training simulations, astronauts in Houston schedule contacts with students via Amateur Radio in order to simulate the communications they will be having while in orbit. On this day two school contacts were scheduled both with Challenger learning centers, one in Alaska and one via Club Station N2SJ at the New York City Center for Space Science Education. The students prepared questions for Col. Wheelock. Following a test run a week earlier, N2SJ using a local IRLP node 4184 (K2QQ) logged into the Discovery Reflector 9010. As the time of the contact approached we had our students monitoring our local IRLP node frequency and you could imagine their excitement as a call from K5BOC came booming in for N2SJ. Each student started with their name and asked their question including “How much supplies do you bring? How do you sleep? And, “Are you bored when you take off?” Astronaut Wheelock fielded all the questions quite adeptly, the connection was very good with excellent audio so it was very easy for the students to hear all the responses. The staff of the New York City Center for Space Education videotaped the entire contact. Prior to the contact the students received an introduction to Amateur Radio. All of the students will receive a DVD documenting their contact with Col. Wheelock,a copy of the Hello ARRL video and a leaflet on how to become and how to obtain their amateur radio licenses; many students indicated they would like to go on to receive their own amateur radio licenses. We worked closely with Katherine Brown, Director of Development at the New York City Center for Space Science Education to coordinate this event. In addition, we would like to thank Bradley Feldman, KK2QQ for use of the IRLP node that he administers and for his help and advice in ensuring a successful contact. The students and staff at the New York City Center for Space Science Education all enjoyed the contact and we have been told by NASA that we can expect another call in the future for further school contacts. 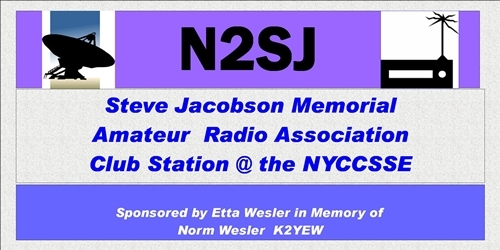 The Steve Jacobson Memorial Amateur Radio Association is indebted to Etta Wesler for her generous donation from the Estate of Norm Wesler (SK). 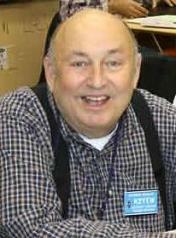 It was Norm’s dual band two-meter Kenwood radio that we used for this contact.